"A number of restrictions on missionary work were introduced and legal liability was put in place for the violation of these new laws," the SCLJ explained, promoting a webinar on Thursday that will address the issue. 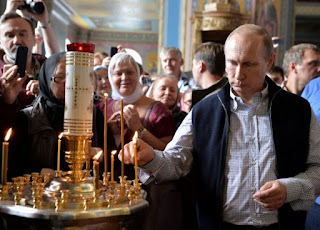 The organization is set to review the changes to Russia's law when it comes to freedom of conscience and the activities of religious institution; the rights of foreign citizens to conduct missionary activities in Russia; and how to carry out missionary work in the world's biggest country without breaking the law. "Please pray for our brothers and sisters in Christ in Russia and pass along the information about this webinar to your pastor and any others who may know about missionaries in Russia who could find it useful," the ACLJ added in a statement. "We will continue defending Christians around the globe to ensure their rights to share their faith are protected." Thousands of churches across Russia came together in prayer and fasting in July against Putin's law, which effectively punishes any kind of religious evangelization outside of churches. Hannu Haukka, president of Great Commission Media Ministries, told National Religious Broadcasters at the time that the new legislation is the most restrictive move in "post-Soviet history." "This new situation resembles the Soviet Union in 1929. At that time confession of faith was permitted only in church," Haukka said. "Practically speaking, we are back in the same situation. These anti-terrorist laws are some of the most restrictive laws in post-Soviet history." Others, such as Thomas J. Reese, chair of the United States Commission on International Religious Freedom, also criticized the law, warning that it would "make it easier for Russian authorities to repress religious communities, stifle peaceful dissent, and detain and imprison people." Reese added that neither the new measures "nor the currently existing anti-extremism law meet[s] international human rights and religious freedom standards." SCLJ attorney Vladimir Ryakhovsky said that July 7, the day Putin signed the bill, was a "black day on the calendar." He added that the politicians behind the law "do not understand religious practice," but asked Christians not to "succumb to panic when [the government] threaten[s] you with all kinds of horror stories."